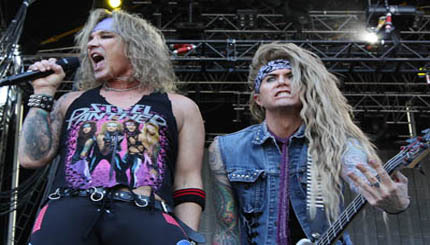 Steel Panther are a glam metal band from Los Angeles, California and are mostly known for their profane and humorous lyrics as well as their exaggerated on-stage personas. Formed in 2000, the band has formerly been known as Danger Kitty, Metal Shop and Metal Skool. The Aldo Nova song "Fantasy" was remade by the band into a faster paced song for the MTV original series Rob Dyrdek's Fantasy Factory. The remake was released on iTunes on December 8, 2009 and their album Feel the Steel was released in June 2009.